DESCRIPTION: Up to 15cm long these attractive galls are caused by a gall wasp and are best found during autumn and winter when foliage is lost. 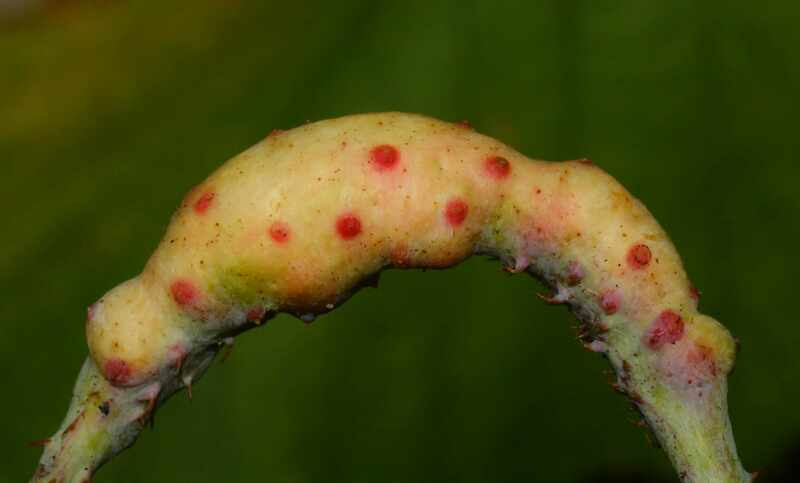 The elongated swellings are green at first punctated with red pimples that indicates the inner chamber of a larva. In summer the galls go from yellow to purplish to light brown with the larva overwintering inside before emerging the following spring. One gall may contain up to 200 rounded chambers. Once used the galls become woody and can remain on stems for several years. DISTRIBUTION: Local throughout Britain, most common in the south and the east. HABITAT: Found on stems of Blackberry and sometimes Raspberry canes.